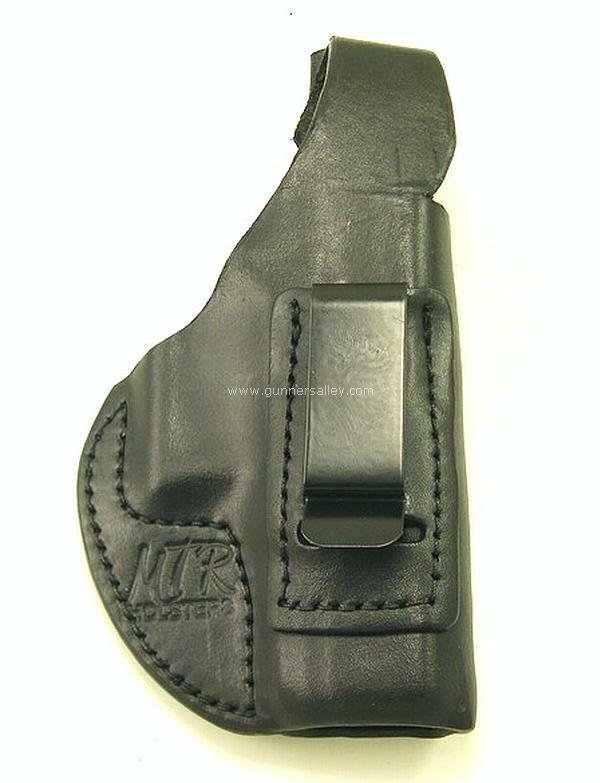 The MTR Custom Adversary is a clip-on inside the waistband (IWB) holster with a reinforced body shield. The idea for the Adversary surfaced when MTR decided to produce a clip-on IWB with all the customer requested features that MTR liked but minus the things they didn’t. The result is the Adversary holster and it's one of our top sellers. Produced from Grade-A 6 to 7 ounce premium bull hide in the USA, the Adversary is designed to worn on the strongside in the 3 O’clock position, just behind the hip, or with appendix carry. The holster attaches to the belt using a black powder coated metal clip that will fit any belt up to 1 ¾” wide. Made with a 0 cant (riding straight up and down), the Adversary also features a reinforced body shield. Many competitors use an un-reinforced body shield, but Matt from MTR prefers the reinforced model as it won’t collapse over time. The body shield is a favorite for many who carry a handgun under a base layer or up against bare skin. The Adversary rides deep in the waistband for excellent concealment, while still allowing for a full firing grip during the draw. While the Adversary doesn't come specifically with a reinforced holster mouth, the rigidity of the the bullhide does a good job of keeping the holster mouth open, allowing for easier reholstering. The Adversary is a great choice if you’re looking for a comfortable IWB that can be worn all day. #1- I see this holster is advertised as having a bodyshield, but I'm not quite sure that that means? The bodyshield is basically a piece of leather that is built into the holster that rides up between the edge of the holster and the wearer. It's really designed to protect the wearer from the sharp edges of the handgun or revolver. 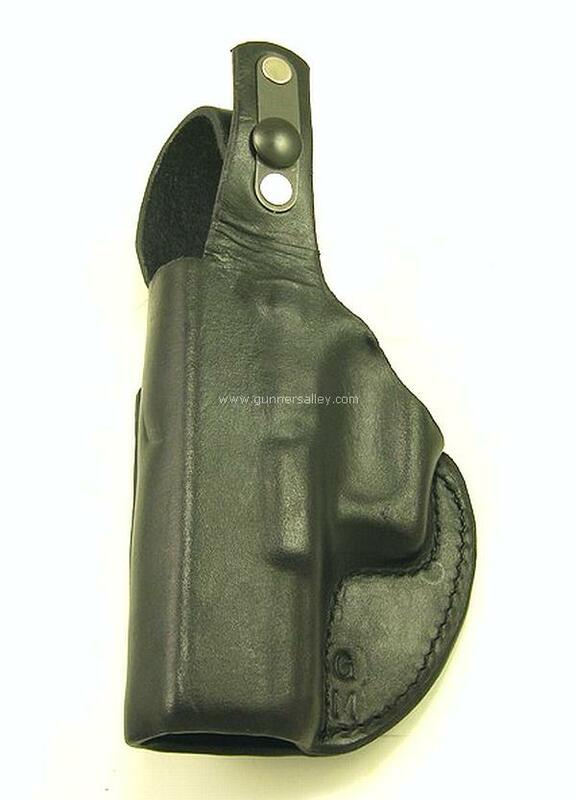 #2 - I also that this holster has an optional thumb break, but I'm confused as to what a "thumb break" is? Can you please explain? Also, do I need one of these "thumb breaks" to keep the weapon in the holster? This little gem has a bit of a minimalist look to it but it fits so well and is so sturdy. It really is well made. The mag holster is equally well made. I bought a second. This holster was everything I expected. The service from Gunners Alley was excellent. I would not hesitate to order anything from them. Have 5 MTR custom holsters and recommend them highly. For craftsmanship and quality they have no competition. Excellent holster, fit was perfect after I worked in the leather. I had ordered holsters from other companies (Ruger LC9s with centerfire lasermax) and from other holsters manufacturers I always ended up tweaking. HIGHLY RECOMMEND. Well worth the money and waiting time. I have already ordered another holster for a different weapon. Good looking holster. A little stiff at first but they have instructions on breaking the leather in. The leather broke in well in a couple days. Have a Taurus 605 and it fits perfectly. I like the retention strap as I ride a motorcycle, the strap works without problems. It was worth the wait. Thumb break. The holster was for a Sign Sauer 93i8. I received an email asking if I wanted it for the C&L position or just a retainer. I really appreciated the extra effort they took to make sure I got what I wanted. I would not hesitate to order anything from this company as the quality of the product and the service were great. I give this holster AND company 5 stars. I was contacted right away after my order to confirm it and advise me of when to expect receiving it. It arrived much sooner! It is very well designed and made. Fits comfortably and fits my pistol exactly. I am able to reholster easily Very happy with my purchase! This is the perfect holster for a 1911. We have been searching for a holster that would work the way we wanted and this did the trick! Excellent quality, perfect fit, excellent customer service!!!! This is a good holster that fits all 3 of my firearms great. Not one holster but 3 holsters. Sounded like I meant one fits multiple guns--no. My last one was too snug but I followed the fit instructions and within 3-4 days, it is fine. Quality, heft, good spring on the holster too. If you are looking at it, I can recommend it. I bought this holster for my FN509 with a crimson trace light and laser and it's absolutely beautiful!!! It's secureds well inside my waist band but remains easy to access! The quality of the product is excellent and Inlove it!!! Click the button below to add the MTR Custom Adversary Clip-On IWB Holster with a Bodyshield to your wish list.